This disc was pirated and re-issued as Gilbert & Sullivan Overtures, performed by the fictitious London Radio Orchestra, under the direction of the fictitious Frank James. This record contains overtures issued with the Gilbert and Sullivan For All series. The overtures included are Yeomen, Gondoliers [abridged], Pirates, Iolanthe, Mikado [abridged], Ruddigore and Pinafore. Sir Charles Groves was evidently a lover of Sullivan's music. 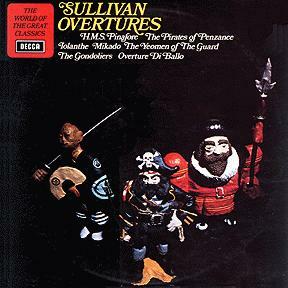 In addition to this compilation of overtures, he also recorded the Overture di Ballo (re-issued on CD coupled with the Sargent Iolanthe) and Sullivan's Symphony in E (re-issued on CD with the Sargent Patience). The contents of this disc are the overtures to: Yeomen, Gondoliers, Patience, Iolanthe, The Mikado, and H.M.S. Pinafore. The Gondoliers overture omits the "cachucha" ending, which the liner notes make a point of saying is unauthorized. The principal attraction on this album is seven selections of music of the English composer Eric Coates, but there are also three G&S overtures: those of The Mikado and Ruddigore conducted by Charles Mackerras (not Sir Charles here), and that of The Yeomen of the Guard conducted by Kenneth Alwyn. The latter is undoubtedly the same recording featured on Alwyn's own overtures disc, while the Mackerras selections are probably the ones he recorded in 1957. Interestingly, Mackerras recorded Yeomen in the same compilation, but the Alwyn recording was chosen here.